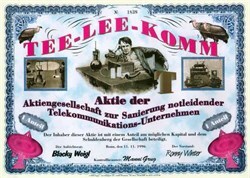 Beautifully engraved Certificate from the Tee - Lee - Comm (Telecom) issued in 1996. This unique document from Germany was has an ornate border around it with a vignettes of Thomas Edison, various inventions and vultures. This item has printed signatures.